That is something my wife taught me many years ago when my children were growing up whilst doing the martial arts with me. She said, ‘what better way to keep everybody together in the family and share the same interest’. She also believes kids should not be readily afforded free choices when parents know they are onto a good thing (martial arts). Kids sometimes don’t know what they want but parents do so parents need to be parents. What better way to train together as a family. Nothing worse than a parent having to say, ‘on Monday 5pm I have to drop my daughter to dancing, at 6pm I drop my son off to tennis, on Tuesday my son has soccer training’ etc, etc. Family becomes disjointed. When kids become bored that is a normal reaction because that’s how some kids are. They will even get bored watching TV given enough time. So is that a good enough reason to pull them out of the martial arts? So this is what you do as a parent. Be strict and be consistent with focusing children’s attention. The kids will be happy when they grow up because you have kept them in a discipline and are now reaping the rewards of continuing a lifelong interest and keep healthy and fit for the rest of their lives. 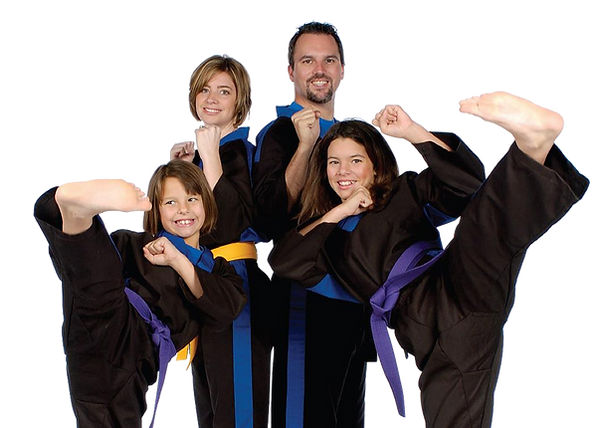 The martial arts is the best way to spend time with your kids. A family that trains together stays together. How often do students switch off when the instructor shows a technique they have seen many times before? It’s because the student has a mental blue print of what is about to be shown and some of them have a tendency to switch off. The end result being no improvement or being worse off. When the instructor takes the time to show anything students need to be extra alert. Is there something they have missed before, is the instructor going to say something different, is it going to be presented differently? You can only improve by picking up new detail and and then continuously practising. Improvement requires attention not assumption. Both pictures of the Mona Lisa look exactly the same except for one small detail. When something is showed to me I enjoy seeing the same thing over and over again to see if I can spot the difference, this is what you makes you improve. You will only find this if you concentrate and look carefully. Remember this when the instructor is teaching. There are many things you need to do to be an effective martial artist. If you are a karate athlete you better know a little about boxing. If you are a boxer you better know a little about wrestling and so on. Welcome to the world of Mixed Martial Arts (MMA) or Mixed up Martial Arts (MMA). The good news is there are schools that will provide cross training under the one roof whilst still maintaining aspects of the chosen martial art. The point being if you want to be able to handle a variety of street situations or deal with a person of another martial art then do what the plumbers and electricians do because an electrician knows how to change a tap and a plumber knows how to change a light switch. They are in the business of knowing what the other knows and does. As an Instructor this is what I was doing in the ‘90’s when I took up Muay Thai and a number of Jiu Jitsu sessions and seminars which kind of felt weird back then because I thought of it as sacrilege to my karate which I had been training religiously for such a long time. Martial Arts are what they are today because of daring to crossing the borders. BE PROUD TO BE A BLACK BELT! Everybody can do the martial arts but very few can be a martial artist. Being a martial artist requires dedication, positive attitude, inquisitive mind and willingness to help others. There are so many other positive sides to being in the martial arts but sometimes we overlook these because we may get railroaded with distractions that might appear to be a little more interesting at the time (but how long for). Those who fail to achieve Black Belt will often regret it sometime down the track; similarly, those who quit at Probationary Black Belt will also experience failure because it takes 12 months of solid training for promotion to Black Belt 1st Degree which is the final stage of the Black Belt graduation process. Not all schools recognise a Probationary Black Belt as Black Belt because of not fully completing the programme so it is a real shame to throw it all away. Quitting is not just about leaving the martial arts school. It’s about leaving all those hard years of sweat, blood and tears (pardon the cliché). They also leave the camaraderie behind which is one of the greatest reasons to stay in the martial arts – unique friendship. You have to wonder what is it in their life which has them prompted to give it all away; that could be a concern for any parent or family member. Mateship outside the dojo can be a big cause for falling off the beaten track in the martial arts. My advice to students is not to get carried away by spending too much time with friends because it can be counterproductive. Beware of friends who will distract you from your training because they have nothing to lose if you miss out on what you love best. They are not martial artists but you are, so they won’t understand. When a Black Belts does drop out, I say WOW because I look at them throwing part of their life away. There has been a number of times I have been able to talk students out of quitting which has been a blessing to them and they are now Black Belts and still actively training. They are proud to say ‘I am a Black Belt, not ‘I used to be a Black Belt’. Be proud to be a martial artist, be more proud to be a Black Belt and even more proud to continue being a Black Belt. Everybody can see your belt around your GI but if you look closely it is there every other time because the belt is a representation of who you are. When instructors hear ‘I NEED A BREAK’ from martial arts students, what does that really mean? Instructors accept students will leave from time to time for a variety of reasons but ‘I NEED A BREAK’ coming from long time students is a little hard to fathom for any instructor. Kids don’t have a mortgage or second job so they really need to come up with a better excuse. In particular for young people this is sadly the first step to say ‘it is OK to give up’. If the martial arts were the most important thing they wanted to do when they first took up training with the goal of achieving a black belt one day then I would think that positive energy and drive will now be lost which will eventually filter in other areas. I’ve seen it many times over. It is not a matter of why some people quit and others do not. It is really about those who strive to achieve and others who will make a decision based on a few badly chosen words. I like telling parents do not let children rule the roost. There are many times as parents we do not let children make decisions in many situations because we may regret it later but some of us may overlook that when it comes to the martial arts. Too many parents come running to me after a few months of their child quitting (sometimes years) to say what a terrible mistake they had made because their child had developed a bad attitude or were losing confidence. I remember one parent coming to me a year later asking to help him with his son who was hanging around with the wrong crowd and had become a graffiti vandal. All I can do is listen because I was no longer in a position to do something about it. If you think the kids need a break then I would ask parents to monitor that spare time and not waste it with social media and electronic games or even hanging around with people you do not know. When any student leaves the martial arts they lose valuable skills, knowledge, self defence, fitness, positive mentoring, and good friends in a positive social circle they have come to respect and enjoy each others company. There will be times we might sustain injuries, some minor or some serious, and we might believe that absolute rest is necessary. Whilst this might be true for particular injuries, there are many situations where injuries can be managed during training. This is not only good for putting some normality in a person’s life but may give them a boost of confidence and down grading self pity which are important ingredients for a successful and speedy recovery. All it takes is a positive approach and letting the instructor know what you can or can’t do; this is the part a student might find difficult doing but there is nothing to worry about. Many instructors, however, admire the student who is so keen to ‘stay with it’ and they are the ones who recover much quicker. This way the timeline does not get broken. It’s just something to think about if anything should happen to us. Jiu Jitsu is not for everybody but the fact that most martial arts schools are including some Brazilian Jiu Jitsu (BJJ) in their curriculum indicates a growing interest and a need to adapt to the changing environment because self defence is no longer just a stand-up game. 1. Who’s got the time? 2. Who wants to go to the ground anyway? 6. How do I wrestle with my arms folded? 8. I’ll teach MMA, no worries about belts and certificates. 8. I better learn Jiu Jitsu before I start teaching it. Forget the Ice Bucket. Take up Jiu Jitsu if you want a real challenge and don’t forget to donate. There has been a steady inclination of interest and promotion of the so called ‘killer’ martial arts that boast and promote devastating techniques. Gouging eyes and striking vital parts of the head can be effective but how good will they be when you have to answer for your actions? If these ‘devastating techniques’ are the only options then people better be prepared to defend themselves in court as well. The legal system does not always take too kindly of people inflicting unnecessary injury even if it is self defence. Inflicting serious injury, in a particular situation might end you in more trouble than you can ever imagine. If all you know is striking, the excuse of ‘this is all I know’, might not always cut it in a court room. Idiots who openly boast about doing MMA is like a waving a red flag at the legal fraternity who will have a much harder time trying to justify themselves because the public associates MMA with Cage Fighting, not self defence,. Any idiot can claim to know MMA; they don’t need certificates, belts or anything else so students are going to be taught irresponsibly. More and more schools will include Jiu Jitsu as part of their training to ensure students have access to passive techniques which may be more suitable in less hostile situations. We also have a – ‘Duty of Care’ which means a legal obligation which is imposed on an individual requiring adherence to a standard of reasonable care while performing any acts that could foreseeably harm others. In Jiu Jitsu choking someone out in self defence may be reasonable but care must be taken that the attacker does not hit their head on the ground which can lead to serious injury or death. I believe all martial arts have a purpose and I take my hat off to anyone who wishes to indulge in their particular art but, in this day and age, it is becoming increasingly important that self defence involves Jiu Jitsu which may be more appropriate in many situations. Also, another consideration is that a fight might end up close quarter or even on the ground; there is no referee to break it up. Including Jiu Jitsu with your standup game is certainly going to increase your chances of survival. One has to look at some of the hostile situations on Youtube then you will understand that we need to be prepared in more ways than one.